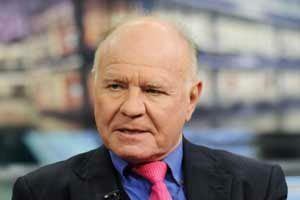 Earlier this month, famous investor Marc Faber reiterated something we've long told our readers: You need to own gold. And you need to own it now. Especially in the face of cyberterrorism. In a recent interview with Metal Masters, Faber noted that the biggest geopolitical risk for Americans today is not a conventional war, but rather cyberattacks that could take down the entire U.S. power grid. If that were to happen, noted Faber, gold would become an "irreplaceable medium of exchange." "It's good to have a diversified asset outside of the banking system and not financially related," said Faber. That way, if cyber hackers did go after the power grid – or the stock market – you would have investments not tied to either of them, according to Faber. On Sept. 29, a U.S. government deadline could be responsible for the next gold price rally in 2017. That is, if members of Congress don't agree on one important issue: the debt ceiling. The debt ceiling limits how much debt the federal government can carry at any given time. Right now, the current debt level of $19.9 trillion is just a hair away from the $20.1 trillion ceiling. Unless Congress agrees to raise the ceiling by the deadline, the government will essentially run out of money and will no longer be able to cover its expenses. As dysfunctional as Congress is, it's unlikely they'll allow that to happen. But too much partisan bickering as the deadline approaches could cause a credit downgrade. Right now, the United States has an immaculate AAA credit rating – meaning the country has the smallest risk of not paying back debts. However, hostile politics leading up to a debt ceiling deadline could urge ratings agencies, like Fitch, to downgrade that rating to AA. For example, on Aug. 5, 2011, S&P downgraded the United States' credit rating for precisely that reason. This immediately resulted in a stock market sell-off. The Dow Jones plunged 2.7% over the following month. If the debt ceiling isn't lifted by the deadline and a ratings agency like Fitch or S&P issues a downgrade, a sell-off as big as 2.7% is certainly possible. But here's the kicker: This would likely boost gold prices, as investors would rush to hedge their portfolios against the market dive. In fact, the Aug. 5, 2011, downgrade sent gold prices soaring 13.6% in just one month. According to Peter, this event would help lift gold 5.3% to his bullish end-of-year price target. "I will keep you updated on this major deadline as it gets closer in the coming weeks," Peter told Money Morning Members on Aug. 25. "I believe the gold price can reach $1,400 by the end of the year." Subscribers who have been following along with these recommendations are racking up wins at a dizzying pace. Profits like that can be life-changing. Learn all about High-Velocity Profits here – and get in position for the next winner now. My understanding is that the President can change the government's price on gold of approx $42 whenever he wants. If he changed it to $1300, the US balance sheet would look much better. If he changed to $10,000 (!!!! ), it would offset the total national debt. Not my thinking but this appears to be what one Wiseman in your industry thinks. Comments appreciated. Sign me up for the Money Morning newsletter, please. The FED, B of E et al do seem to be running out of cunning stunts to pay their bankster buddies bonuses, what with shareholders expecting them to do something to earn them nowtimes. It strikes me as only a matter of a very short time before they begin to attempt to print their way out of debt. When interest rates rise the party will be over.